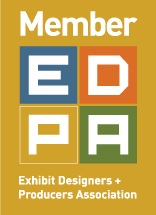 What is the number one goal of your trade show experience? To drive traffic to your booth, right? The more people in your booth, the more opportunities to demonstrate your products, make connections, gather prospect information and secure a new customer! Above is a recently designed 10×20 display for NYXRP to show at InterBike 2014 at the Mandalay Bay Convention Center in Las Vegas. Our trade show exhibit graphic designers and sales team worked with our customer to create an interactive, exciting trade show design that would drive traffic to their space. You can see from the live action shot above that we were successful. They were able to attract so many people to their booth consistently throughout the event that their exhibit was literally invisible! So besides having a killer trade show design, what are some ways you can make your booth so busy that your exhibit is almost invisible? Be the Charging Station. It’s shocking that so many shows don’t offer attendees a charging station. Especially with intermittent Wi-Fi that tends to really drain your phone battery while searching for a signal charging up is a necessity. Even when a show offers a charging station it is often just a power strip and a table. Instead offer a charging oasis to drive traffic. Key tip: Don’t waste this opportunity. Have a video demo on loop at the charging station for your captive attendee audience, after the video is over, ask what their business challenges are and what they came to the show to find. Be the Wi-Fi Hot Spot. At your booth, create a broadband cellular hot spot, using a MiFi. What’s a MiFi? MiFi stands for “My Wi-Fi”. A MiFi device can be connected to a mobile phone (cellular) carrier and it provides internet access for up to ten devices. It costs around $50 a month. Check out Clear recommended by David Pogue of the New York Times. Timothy Carter also has a few ideas that will bring people to your booth. One idea requires a different design and the additional of some comfortable trade show furniture, but if it is in your budget, your booth will definitely be THE destination spot. Tradeshows can get crowded and confusing. Turn your space into a welcoming oasis that gives attendees a break from the chaos. Offer them comfortable furniture, snacks, and bottled water so they can unwind while learning about your company. They’ll gladly listen to you if they can relax during the conversation. Plus, they’ll tell their friends and colleagues that they can catch a break at your booth. There’s also a good chance that people will share what you’re doing via social media at your tradeshow booth space. That will drive even more traffic to your booth. By the way, just in case you were curious what the NYXRP 10×20 linear trade show display looks like when it isn’t packed with prospects, here are a couple of pictures of the booth from our warehouse, where it was assembled. 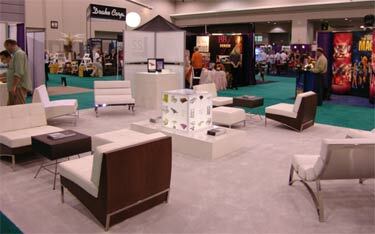 Curious as to how you can make your trade show displays invisible?